How many 3-digit even numbers can be formed from the digits 1, 2, 3,4,5,6 if the digits can be repeated? A number to be even must be divisible by 2. A number to be divisible by 2 must have unit digit which is divisible by 2. The unit digit can 2, 4 and 6. Le the unit digit be 2. Similarly the first digit can be filled by all the six digit. Anything which occupies mass and space is called matter. For example book, pen, pencil, water, air. It can be exist in three physical state solid, liquid and gas. These division are being made on the basis intramolecular force between them. Solid have the highest then liquid and gas being the lowest. Solids have definite volume and definite shape. Gas have neither definite shape nor the volume. 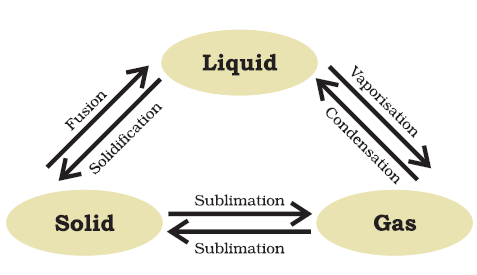 These three states of matter are interconvertible by changing the conditions of temperature and pressure.